Record numbers of people learn about their own bodies in Milwaukee. The popular " Body Worlds " exhibit is causing all kinds of excitement, as visitors to the Milwaukee Public Museum get a glimpse of what their own body might look like underneath the surface, and helping them to identify muscles, bones, organs and nerves. On her second tour of the exhibit, Kay Dudley of Oconomowoc is accompanied by her granddaughter Eva. "I thought it was just fantastic …just really amazing." Eva says, "I thought it was really kinda cool." Since it opened in mid-January, Body Worlds has already broken the Museum&apos;s previous attendance record. The traveling exhibit allows guests to learn about the nervous system, muscular make-up, bone structure, brain tissue and other intriguing aspects of the human body. The prenatal display is most popular with visitors, including Amy Meekhunsut of Milwaukee. "It&apos;s thought provoking. It actually opens my eyes a lot." Many visitors found themselves comparing the displays with their own bodies, searching for parts, recalling an old injury or thinking about a friend. Daniel Kurtz of Milwaukee can better relate to his friend&apos;s injuries after getting another point of view. "I have a friend that was injured in a motorcycle accident so … one of the bodies (on display) had a lot of prosthetics and it makes you think about what it&apos;s like." 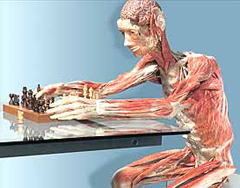 Gunther von Hagens&apos; original exhibition of real human bodies at the Milwaukee Public Museum comes to an end June 1st.